There are stop signs located throughout our community. They are there for a reason. Please stop at the signs, look both ways and proceed. This is a common sense action not followed by many. There are also a few blind corners. Listen for the sounds of children who may be playing around the corner and proceed with caution. Please advise your guests of the speed limit, stop signs and to be careful as our children are outside playing and not always aware of vehicular traffic. Residents have been violating the recycling ordinance of Little Egg Harbor Township and the Rules and Regulations of Tall Timbers. Cardboard MUST be broken up and placed in the green recycling containers. DO NOT PUT CARDBOARD BOXES IN THE DUMPSTER OR ON THE FLOORS. Please help us to keep our community clean. Snow season is right around the corner. Please be careful driving and walking through the community during these weather events. We want all of our residents to be safe. The office staff are not on site every day. Therefore, we rely on our residents to report any conditions that may be a hazard. Reports can be made by email or by calling. There is also a number for extreme emergencies: 609-709-9601. Plowing of the roadways does not begin until 2 inches of snow has fallen. The clearing of other ares will begin when the snow has stopped. Each weather event is different. We ask for your patience. as the contractor works to make our community safe. The roadways are a priority. The driveways, walkways, and parking areas will be cleared later. In the meantime, if you have to venture outside, wear appropriate footwear. There are areas of the community that will ice over faster than others due to location and due to re freezing. Be careful of all hazards. Hazardous conditions cannot be completely eliminated. However, with your diligence in reporting we can always be better. Please do not apply rock salt to any concrete. The snow contractor provides our association with extra magnesium chloride to use for concrete if needed for those hazardous areas. when they are not on site. If you should need a small container for your area, please let us know. Have a safe and healthy winter season. Tall Timbers is a beautiful community when the snow is falling . Lets enjoy our community. Please prepare for other types of weather. With weather events there is a possibility of street flooding, and power outages! Sections of Timberline Drive and Pebble Beach Lane have had flooding issues during heavy downpours. If you live in these areas, it would be a good idea to move your vehicles to higher ground. The Clubhouse area is a high point and there is parking. When you hear a "flash flood alert" that would be a good to be on the alert and prepare to move your vehicles. If the catch basins in the streets appear to be full of leaves, please contact the emergency number or the office during operating hours. We will get to them as soon as possible. Secure outdoor furniture, grills, lighting, and decorations as they could cause damage and be damaged during a high wind event. Make sure emergency lighting is working should there be power outages! Reminder: if you have not signed up for NIXLE to receive alerts on your cell phone, it would be a good idea to do so now. The Tall Timbers email is checked on a regular basis when the office is closed. You may leave a message at tthoa@verizon.net. If there is power, someone will get back to you. In the case of an extreme emergency you may call 609-709-9601. 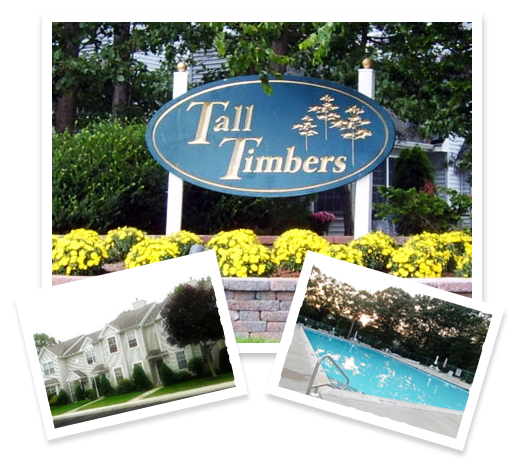 The community of Tall Timbers is located in the heart of Little Egg Harbor Township, New Jersey. We are minutes away from the municipal complex, post office, pharmacies, medical facilities and shopping locations. Tall Timbers can be reached from Route 9 or the Garden State Parkway. The Bass River State Park, Freedom Fields Park, The Seaport and other areas designated for recreation are within a 10 minute drive. There are two golf courses in Little Egg Harbor along with many areas for fishing and clamming. The amenities of our community includes and outdoor pool, tennis courts, walking trails and a clubhouse that is used as an office and for social events for residents. There are three entrances to our community: Center Street and Radio Road. Public transportation is within walking distance at the Radio Road Entrance. Tall Timbers is made up of townhomes and condominiums. Wooded areas surround our community. If you enjoy nature this is the community for you. Kathleen Capron, Carmen Oyola and Michael Broderson were voted to serve on the Board for two years. Congratulations!